Formed in 1972 by Uwe Karpa (guitar) and Matthias Ulmer (organ) in Stuttgart, together with Sascha Pavlovic (drums) who at the time were all 14 or 15 years old. They played covers mostly at the start, with sets that included Deep Purple and Cream numbers, along with a growing repertoire of self-penned numbers. Changes in style happened when new drummer Hansi Derer joined, and more so when Harald Bareth (bass) took over as lead vocalist. By the time they gained a record contract, Anyone's Daughter had advanced considerably, as one of the many progressive rock bands to appear in the late-1970's inspired by the likes of Genesis, Gentle Giant, Jane, et al. Anyone's Daughter were far better than most, and they quickly became a favourite amongst "prog" fans. 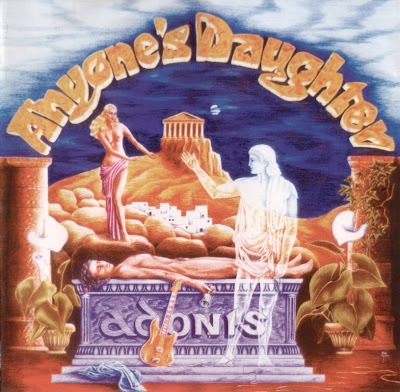 Their early albums featured English vocals, ADONIS being a very accomplished debut of refined progressive rock, with strong symphonic elements, jazzy touches and a notable debt to Eloy. Obviously intent on trying to get international fame their second LP, tried for an even more direct style, but paled next to ADONIS. A radical change from hereon, especially on their third album PIKTOR'S VERWANDLUNGEN, a conceptual opus (live in concert) featuring mainly spoken German texts along with vast instrumentals in the realms of Novalis and Grobschnitt, and only a couple of actual "songs", it is arguably their most successful, and certainly their most experimental. IN BLAU returned to a more accessible style, almost like mid-1970's Genesis sung in German. A good album, but from hereon the Anyone's Daughter sound paled significantly, with shorter compositions on an ever more melodic song based level. The LIVE double was thus very disappointing. Only Ulmer and Karpa had remained consistent, and a year on after LIVE the rest of the band were: Gцtz Steeger (drums, vocals), Michael Braun (vocals, piano), and Andi Kemmer (bass). LAST TRACKS collects recordings from these last sessions, along with demos for the first LP. The 2001 reformation was passable in that it still resembled Anyone's Daughter in the song style, but musically was very different. Much better, of course, is the 2CD collection, the aptly titled REQUESTED DOCUMENT LIVE 1980-1983, collecting live material from their "classic" era, and the Volume 2 set, with a DVD, offered a rare chance to see them in concert. Thanks for more Krautrock I do not have, read the above in my own Cosmic Egg a while back.